Good news, vegans: A new study finds that kimchi made without fish products has the same type of bacteria as more traditionally made kimchi. That finding suggests that any "probiotic" benefits associated with traditional kimchi could be present in vegan versions as well. Along with other fermented foods like yogurt and kombucha, kimchi is surging in popularity as a probiotic food—one that contains the same kinds of healthy bacteria found in the human gut. A traditional Korean side dish, kimchi consists mainly of fermented cabbage, radish and other vegetables. But it's normally made using fish sauce, fish paste or other seafood. That takes it off the menu for vegans, who don't eat any products derived from animals. But in order to appeal to vegan consumers, some producers have begun making a vegan alternative to traditional kimchi. 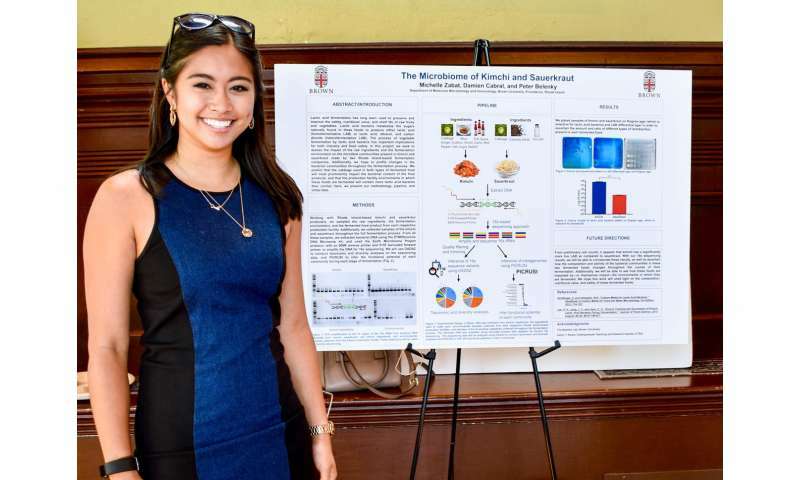 "In vegan kimchi, producers swap in things like miso, which is a fermented soybean paste, in place of the seafood components," said Michelle Zabat, an undergraduate at Brown University and lead author of the study, which is published in the journal Food Microbiology. "We wanted to know what the effects of making that swap might be in terms of the microbial community that's produced during fermentation." Working in the lab of Peter Belenky, an assistant professor of molecular microbiology and immunology at Brown, Zabat partnered with Chi Kitchen, a Pawtucket, R.I.-based company that makes both traditional and vegan kimchi. 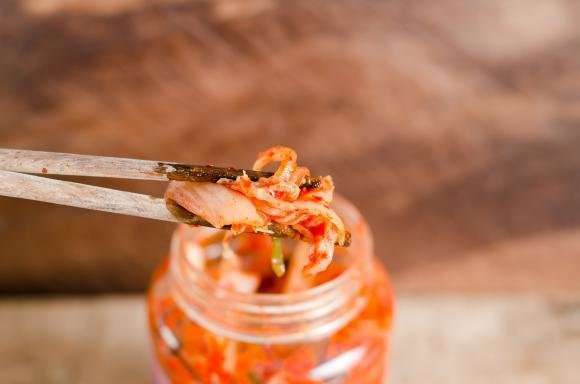 The researchers took bacterial samples from the starting ingredients of both kinds of kimchi, as well as samples during the fermentation process and from the final products. The team took additional environmental samples from the factory, including from production tables, sinks and floors. The researchers then used high-throughput DNA sequencing to identify the types of bacteria present. The study showed that the vegan and traditional kimchi ingredients had very different microbial communities to start, but over the course of fermentation the communities quickly became more similar. By the time fermentation was complete, the two communities were nearly identical. Both were dominated by lactobacillus and leuconostoc, genuses well known to thrive in fermented cabbage. Those bacteria were present only in small amounts in the starting ingredients for both products, the researchers found, yet were the only bacteria to survive the fermentation environment. That's not exactly what the researchers expected to see. "Miso has a lot of live bacteria in it at the start," Belenky said. "The fact that those bacteria were lost almost immediately during the fermentation was surprising. We thought they'd carry over to the kimchi, but they didn't." That's likely because bacteria found in the miso thrive in extremely salty environments, and the kimchi isn't quite salty enough for them. "If we made really salty kimchi," Belenky said, "we might see them." The study looked at only one brand of kimchi, and it's not a sure thing that the findings will to the same for other brands. In fact, researchers point out that the microbial community that dominated the kimchi they tested closely matched the community in samples taken from the production facility. It's not clear from this study whether those bacteria in the environment came from the kimchi or the other way around. It's possible, the researchers say, that the facility provided a "starter culture" that influences the eventual microbial community in the kimchi. Either way, the findings show that it is indeed possible to make a vegan kimchi that's remarkably similar in terms of microbes to for kimchi that's made with more traditional ingredients. The jury is still out on whether consuming probiotics actually makes meaningful changes to the gut microbiome or has any overall health benefits, the researchers say. But to the extent that consumers want products with probiotics and producers want to cater to dietary restrictions, vegan kimchi appears to fit the bill. vegans are among the most unhealthy of humans. Vegan males outlive omnivore males by over 8 years. As for reasons why, I'd say lower % methionine in their protein sources, and less exogenous advanced glycation endproducts, but thats my guess. Studies show that eating Vegans increases life expectancy. By grinding up Vegans into a pate served with crackers and olives, one can increase their lifespan by 20 years or more. CubicAdjunct - Read the science. Jokes are for comedians. I'm not here for the laughs. but checkedout... your response made ME laugh out loud! Regardless, this article is about kimchi (a taste treat I enjoy on occasion) production methodology, not vegans. 'metagenome indicated that the kimchi microbiome was dominated by members of three genera: Leuconostoc, Lactobacillus, and Weissella.' and the presence of large amount of bacteriophages. So mack, pious Jain wear face masks to prevent accidental inhalling of flying bugs. And carefully whisk their walkway clear of ground bugs. At least they acknowledge that there is a measure of inconsistency in their vegan beliefs. Myself, what I find interesting about kimchi (uhhmm, yummy!) is the historical perspective. That food products such as Korean kimchi & Hongeo-hoe, Taiwan stinky tofu, Norwegian lutfisk, Icelandic rotten shark. All share similar origins. Peasant societies under constant threat of invasions and pirate/slaver raids. Needing some way to hide their food supply from rapacious conquerors and thieving robber barons. By producing foods repellent to the invaders and tax collectors. Disgusting the soldiers, aristocrats and priests by the stench! Of course drinking peasant rot-gut, paisan moonshine helps numb you to the taste. Bolstering your argument, @rrwillsj, lutefisk is traditionally consumed with aquavit. :P I tried it. Yes it's truly nasty. Not at all like caviar and vodka which is pretty good. Caviar and champagne is rather like really good red wine (think California cabernet or Bordeaux) with a cigar. I'm OK with a cigarette and a bitter ale but there have to be limits. As far as kimchi goes it has its places in some things but it's not necessarily for everything. Cautious experimentation is the key here. And it's pretty much six of one and a half-dozen of the other whether it's vegan or not from over here. Nawww, @Whyde, Koreans have this stuff called "soju." Not to be confused with Japanese "shochu." It goes over 100 proof. Knock your socks off. Fix anything you find wrong with your kimchi in a heartbeat. Prolly designed to poison the tax collectors. I've had it. More than I prob'ly should have. I do not know if this is true or not. I vaguely remember reading that in historical times. That many ancient societies, when a royal court was trying to make a decision. They would talk it out over a few dozen drinks. Then required that the decisions made be reevaluated once everybody had sobered up. Except for the Persians. Instead they would make their preliminary decisions while sober. Than reevaluate those during a rip-roaring drunken debauch. If the decision still sounded good during intoxication? Go for it! I guess whatever works for you. It was "really?" in Anglicised Korean. Sorry, bad joke.